Scarlett Reverie: Fresh from the box: UFDC Convention Doll - Tonner Scarlett "Return to Tara"
Fresh from the box: UFDC Convention Doll - Tonner Scarlett "Return to Tara"
If asked why I ordered for this doll, I guess you could call it "impulse". I've been tracking some Franklin Mint GWTW dresses -- the rarer ones, and just end up frustrated because I have to dive into bidding with the rest of humanity for them. I think it's also a need to escape (haha) from work and from the stress that made me get this dress. Beyond that, I love Civil War dresses. And this one is a good example of one using Margaret Mitchell's favorite color: green. This doll doesn't come with the usual Tonner hoop skirt, instead a cloud of tulle and a white underskirt. The doll comes with white pumps, stockings and earrings (I assume they're supposed to simulate emeralds). The buttons on the bodice are sewn beads similar to the earrings). The white pumps and earrings. The zigzag pattern and stripes all in perfect symmetry. Tonner's Return to Tara doll can either be a frustration or a work on positivizing (coined) what you have. I was dismayed by the organza but the cut and the fit of the dress is wonderful on the doll. The zigzagging pattern is something to behold too. There is also a jacket the tassels of which do not fall gently on the doll's shoulders as the real dress does (sigh). The green is faithful to the film dress, however I am not too keen on the ribbon-y type of material used. It's too shiny, reminding me of ribbons used for gifts. Nevertheless, over-all, it is a GWTW dress and something which I think is faithful to Civil War dressing. The hairstyle is faithful to the film and with a little tug here and there, one can ease the tightness of the style, loosen it a bit, and make it a little becoming to the face of the doll -- tug I did, until at least I could see Vivien Leigh there -- somehow. 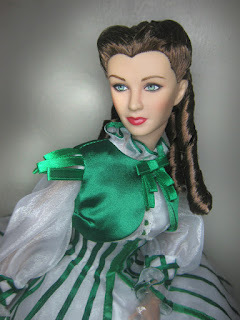 It is a complicated hairstyle and I must commend Tonner hairstylist -- with this at least -- for able to simulate the hairstyle that Vivien wore in the film and a civil war hairstyle that can fit any of the clothing I've found for the doll. The hairstyle is amazing actually and I can only imagine how long it took to perfect such a tight style such as this. Over-all 2 rolls are found on each side. So when the doll faces front the rolls frame the face IMHO, beautifully. The hairstyle: Looking at it, I can only surmise how difficult a job it was to make this one. It is strange that the values added to the doll are nowhere near what we see on screen: A silver comb and mirror with a powder case, powder puff topped with a white rose and ribbon; a miniature GWTW book (capturing the cover of its initial release). I thought the book would have the text in it. No, only the cover and the opening page -- fine by me. 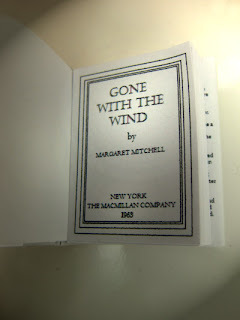 The miniature GWTW book (in proportion to doll size) has the opening text of GWTW written on the back and front cover pages. It also comes with a title page. I think it was a charming addition. 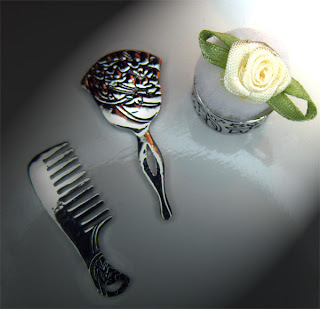 The accesories: Silver comb, hand mirror and silver powder case with powder puff adorned with rose and ribbon. I think she's wondering if she needs a repaint. I think she's pretty as she is -- this one. At least good enough for anyone to "return to Tara". Complete Reference" by Cynthia Marylee Molt. I hope it helps your dilemma. Scarlett #58: "Return to Tara"- #2 Dress: Fitted, except for semi-full skirt. white cotton eyelet. Sleeves are semi fitted with large, rolled back cuffs. the medium green original barbecue dress used in tests. Do I intend to repaint her? Perhaps. I'll think about that tomorrow. But here's a first, I couldn't help but photoshop the doll's face. It's a guide for a repaint. She is the most beautiful doll that I ever seen! 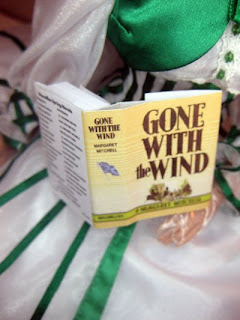 I'm a big fan of "Gone with the wind"
Excellent review! Thanks for taking the time to go into such fantastic detail. Thanks Tink-Sonia! Glad you enjoy what I place in here. Hi Dave! I finally found a way to reply to comments here. I hope I can be consistent. I always forget -- forgetful me. Glad you enjoyed the post. Looking forward to reading more of yours....Did you know I once wanted to live in Disneyland. I still have that Never-never feeling! = ) Keep in touch always!